Need some brush drum loops that swing? Pure Country V delivers the kind of swing and shuffle to make you blush. For all country, folk, rockabilly, and acoustic songwriters. A complete songwriting sample pack, featuring over 350 acoustic brush loops and drum samples recorded in the heart of Nashville. Get some live, acoustic swing and shuffles for Rock, Country, Blues, and More. 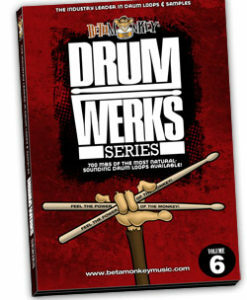 Drum Werks VI is perfect for anyone writing blues, blues rock, and alt-country drum tracks. Create classic blues, folk, and country rock drum tracks with shuffles, 12/8 patterns, and swing feels. An earthy roots vibe will inspire folk, bluegrass and blues styles as well. Traditional 12/8, Shuffles, Blues Drum Loops - You get it all on Drum Werks XXIII. Blues drumming is all about fat backbeats, tasty fills, and, most important, feel. If your blues drum tracks need inspiration, Drum Werks XXIII delivers live, 100% acoustic blues drums. Spanning 45 bpm to 140 bpm, this blues drums sample library offers no-nonsense 12/8, shuffles, Charleston shuffles and other shuffle-based drum grooves. Plenty of triplet-based fills as well. Pure Country III is a complete country drum loops and samples package featuring brushes. This country songwriting pack has over 400 brush drum loops including trainbeats, ballads, Johnny Cash style beats, and more. If your music needs brushes or brush/cross-sticking, Pure Country III has it covered. 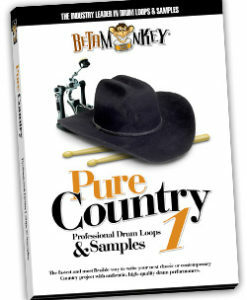 Beta Monkey Music's Pure Country I: Rocking Nashville™ captures the authentic sounds of Nashville with over 500 acoustic country drum loops in nine (9) different Groove Folders™ and a complete matching multi-velocity set of drum samples. This complete country songwriting package features live drums laid down with authority and feel in one of Nashville's best drum rooms. Pure Country I: Rocking Nashville™ will deliver true Nashville inspiration. For Modern Country, Country-Rock. Why Choose Beta Monkey Drum Loops and Samples? There’s a reason why we have shipped our sampled grooves to over 70,000 songwriters and musicians in 39 countries worldwide and every state in the U.S. over the past 17 years. Beta Monkey is your source for 100% acoustic drum loops in all genres whether you are working in Ableton, Cubase, GarageBand, Logic or ProTools. Get pure acoustic drum grooves you can actually use for songwriting. Get the best prices around. Get Beta Monkey and get the drum loops and samples you and your music deserves. © 2019 Beta Monkey. All Rights Reserved.